INVASIVES 2018, the Invasive Species Council of BC's Annual Forum & AGM, was held February 6-8, 2018 at the Pacific Gateway Hotel in Richmond, BC. Summarized highlights of INVASIVES 2018 follow below. View the INVASIVES 2018 presentations here and view the full INVASIVES 2018 program, including abstracts and bios, in PDF here. The INVASIVES 2018 Forum & AGM drew over 175 attendees and presenters from across Canada, the US and the UK. The attendees had diverse backgrounds, including practitioners, land managers, stewardship groups, invasive species researchers, First Nations leaders, local, provincial and federal government - all with a common interest in invasive species. Photo Gallery: Day One of INVASIVES 2018, February 6, 2018. The program for INVASIVES 2018 incorporated a variety of workshops, a superb keynote presentation, Together in Action Awards, plenary and speedy sessions along with plenty of opportunities for networking throughout the forum including an evening reception with poster presentations. Prior to the official opening of the Forum, on February 5, 2018, a strategic planning meeting was held with Regional Invasive Species Organizations and concurrently, the "Indigenous Land Stewardship & Traditional Uses: Building Tools, Networks & Support for Invasive Species Management Workshop" was held. Both meetings were followed by a dinner with a speaker. Special guest Geri Collins presented at the Indigenous Dinner on "Starting and Growing a Business: Funding and Strategies for Invasive Species and Other Opportunities" while special guest Michael Blatchford from Norton Rose Fulbright was the guest speaker during an evening professional development joint session held to increase understanding of conflicts of interest and divided loyalties. On February 6, 2018, the first official day of the Forum commenced with a morning workshop on Best Management Practices. The workshop followed two main themes with three presentations on Soils & Worksites followed by three presentations on Tools & Operations. 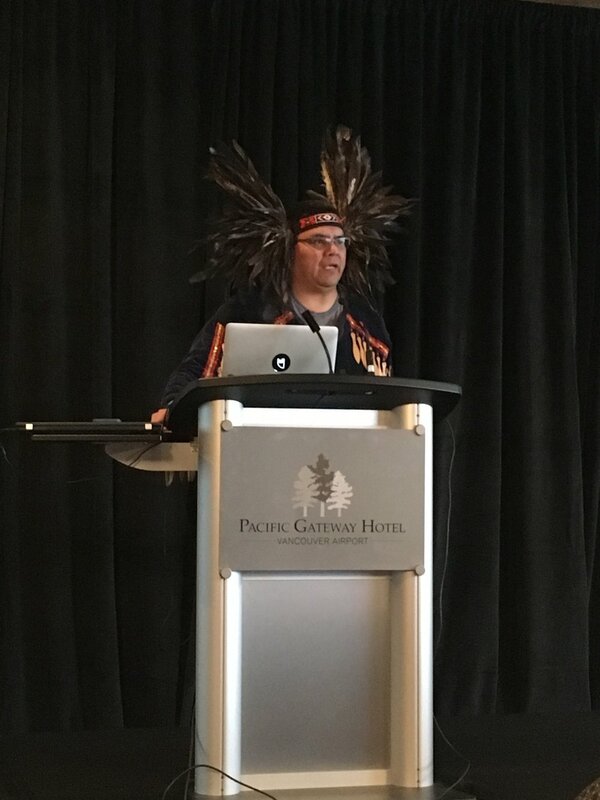 The Forum was officially opened with a welcome and song beautifully performed by Alec Dan, Cultural Representative of the Coast Salish followed by a welcome from ISCBC's Chair, Brian Heise. Photo: Alec Dan, Cultural Representative, Coast Salish. The audience was entertained by and educated on social media for conservation by Keynote Speaker Adrian Cockle, Hootsuite's Global Principal for Non-Profits, who joined us from Guildford, England. Adrian used fantastic case studies of campaigns from organizations including the WWF and The Royal Foundation of the Duke and Duchess of Cambridge and Prince Harry, as he guided us through principals of social media and how to design successful campaigns. Photo Gallery: Keynote Speaker, Adrian Cockle of Hootsuite "Hooting, Tweeting and Roaring: Social Media for Conservation"
The first plenary session featured "Pathways and Vectors" presentations, covering aquatics, horticulture and firewood. Following the break, the final session of the afternoon focused on "Industry and Invasives" - forestry and forage. On the conclusion of the formal presentations, the evening then flowed into the fun "Farm to Fork Reception" which included nine informal poster presentations interspersed with delicious cuisine, live music and beer sampling with Fuggles & Warlock Craftworks, including the especially crafted invasive "Himalayan Blackberry Sour" brew! Forum speakers, poster presenters and attendees mingled and connected, engaging in discussion while enjoying the delicious refreshments and entertainment. Day two of INVASIVES 2018 commenced with an informal "Planning for the Future" breakfast to gather input on the Invasive Species Council of BC's Action Plan for 2018, followed next on the agenda by ISCBC's Annual General Meeting. Following the AGM, and new to the Forum this year, was a series of "Concurrent Sessions on High Interest Topics". Attendees chose their preferred topic for three concurrent sessions and moved from room to room. Following the refreshment break, Brian Springinotic of Habitat Conservation Trust Foundation made a special announcement about funding for lake monitoring for invasive mussels in BC. In the spotlight presentations, we heard from the province's Inter-Ministry Invasive Species Working Group on efforts to help tackle invasive species. The City of Port Moody and the City of Surrey co-presented on their collaborative efforts. The final spotlights was on the Burrard Inlet Action Plan by the Tsleil-Waututh Nation. Innovation and Leadership Award: Rod Nataros, NATS Nursery. Following lunch, the ever-popular Speedy Sessions saw attendees spending 10 minutes with table hosts engaging in discussion on their chosen topic - and moving to a new table and host every ten minutes. This format gives participants a great opportunity for discussion and making connections with subject experts. Download the program to see all the topics. The final session featured presenters on the Emerging Issues of wildfire and invasive plants, Japanese beetle in Vancouver and Asian carp in Canada. The optional Early Detection Rapid Response Boot Camp was held on February 8th and drew a record attendance. The first featured species were Bass, Brazilian Elodea, European brown chafer and Japanese beetle. Wall lizards, Maltese and Yellow star-thistle and goldfish were featured in the second session and in the final session White-nose syndrome, invasive grasses and the Exotic Cyprinid Online Key were featured. Between feature species presentations, participants visited stations with samples, which included a live Wall lizard. The Boot Camp concluded with a fun Jeopardy-style quiz. Many thanks to all presenters and participants who travelled from near and far to make the INVASIVES 2018 Forum a huge success. Attendees and folks who couldn't make it were able to follow and interact with INVASIVES 2018 on social media using the hashtag #INVASIVES2018. The "conversation" was shown on the Tweetwall projected between presentations and during the Forum breaks. Over the duration of the Forum, the tweets and Instagram posts achieved 269,260 impressions from 306 posts.